CJ 4DPLEX, creators of the leadingimmersive theatre technology featuring moving seats and environmental effects, announced today that the number of screens in operation utilizing 4DX has reached 300. 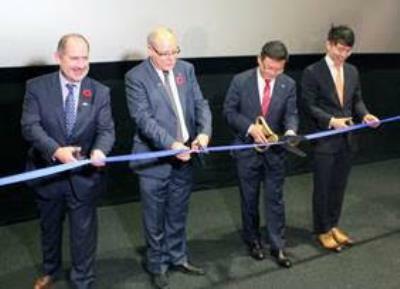 The world’s 300th 4DX screen is also the first in Canada, at Cineplex Cinemas Yonge-Dundas and VIP, which opened on Friday, November 4, 2016. 4DX – which allows the audience to connect with movies using motion seats along with special environmental effects such as water, wind, snow, lighting, scents, and more – has seen its growth rate gradually accelerateeach year. Having reached 300 screens only about seven years since it launched in 2009, 4DX is the fastest-growing premium cinema format – compared with the second-fastest, which took about nine years to reach the same penetration. The accelerated record of 4DX openings this year has been driven in key regions, including China and Japan, which added 30 and 12 new screens,respectively. Moreover, CJ 4DPLEX has strengthened its standing by signing rollout partnerships with major multiplex exhibitors around the world, including Wanda Cinemas, Cinepolis, Regal Cinemas and SFC (the Shanghai Film Corporation), and recently opening the first 4DX-equipped theatres in Slovakia, Puerto Rico, Serbia, the Dominican Republic and Canada. With Cineplex’s first 4DX screen opening in Canada, 4DX is now available in 42 countries around the world. As more theatre exhibitors bring 4DX screens to their auditoriums, 4DX attendance has increased nearly 2.2 times over the most recent three years. 4DX reached 19 million total worldwide attendees from 2009 to 2014, but reached 31 million by 2015. As of November 2016, total 4DX attendance from 2009 is more than 42 million, and with more than 38,000 seats and 300 screens, 4DX theatres have the capacity to accommodate almost 70 million moviegoers per year. Additionally, the number of 4DX titles has been increasing year by year, with more than 370 titles expected to have been screened in 4DX by the end of 2016. The rapid growth rate comes as a result of the positive response from moviegoers, growing interest from global studios to present their content in this premium format, and satisfaction from exhibitors with 4DX as a new revenue stream. To celebrate this meaningful 300th screen opening, CJ 4DPLEX recently released a new 4DX brand promoting ideo, representing 4DX as the world’s first and leading 4D cinema technology, which provides an unrivaled immersive cinematic experience to moviegoers in the world. “We are very overjoyed to open the 300th 4DX theatre. Building off of our remarkable growth and record success, we continue to proactively expand 4DX theatres by adding sites with existing partners and earning more potential to build new partnerships with a number of additional exhibitors all over the world,” said Byung-Hwan Choi, CEO, CJ 4DPLEX. Furthermore, 4DX aims to expand its business with its “4DX VR” offering, which brings a new addition to the immersive cinema universe.The combination of 4DX’s motion seats with VR content will lead the newest trends of next generation entertainment by widening the business opportunities for cinema owners, mall operators, attraction operators, and other players in the worldwide entertainment industry.